We do not use any concentrated sweeteners on the TQIDiet. And this includes giving up stevia. Students are a bit dismayed by this at first because stevia is a sweet-tasting herb that comes without calories and does not raise blood sugar levels. And what possibly could be the problem with that? In fact, zero calorie compounds tend to trigger weight gain by creating blood sugar lows and/or by throwing metabolism off. Animal studies suggest that zero calorie foods make no sense to a living system and as a result end up causing metabolic problems. The concentrated sweet taste of stevia makes naturally sweet foods taste bland and helps perpetuate cravings for far less healthy foods. 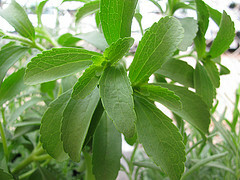 And finally, the type of stevia most frequently used is not a ground up green leaf of an herb. There really is little “natural” about most stevia in commerce. According to some, stevia is a plant with a long history of use as a sweetener: While not definitive, my old Mexican and South American herbals report it as a potential treatment for colic and wound care but make no mention of its use as a sweetener. There are more recent reports of a potential use as a medicinal herb in hypertension but these uses are quite different than adding a pinch of leaf to your coffee for sweetness or a somewhat larger pinch to make your desserts taste as sweet as ever. Given that traditional peoples are not know for eating much in the way of sweets, it seems quite unlikely that the plant has a long well-established use as a sweetener. Most of the stevia glycosides are only present in tiny amounts in the plant. Our stevia products thus require increasing amounts of land, water, and energy to grow enough stevia to provide enough of these compounds and most of the plant is actually wasted. Some companies are working on specialized breeding to increase the various glycosides in the stevia plant but increasingly the preferred production method will be microbial fermentation. While this may evoke images of sauerkraut, kimchee, and a variety of other healthy fermented traditional foods this type of fermentation is quite different. Cargill and a Swiss company Evolva are jointly working on creating “nature identical” glycosides, as is Stevia First Corp. While the plant only makes tiny amounts of the concentrated sweets, the plant, of course, uses a gene to control the manufacture of those glycosides. The relevant microbial fermentation involves taking that gene, silencing a yeast’s gene for fermenting sugar into alcohol and CO2, and replacing it with the gene for the desired “reb.” The yeast with the “right” genes will now make “stevia” for you to put in your coffee and salad dressing. Natural? Not in my book. Safe? Most say it is, that these modified yeast will never escape to start producing stevia instead of causing your bread to rise or show up in some other unexpected place. Nor will these modified yeast share their new genes with other microbes. So they say and they may be right. Ultimately though isn’t it time to reconsider the wisdom of using a product that is not good for you and that will help keep you hooked on concentrated sweet tastes? A product that either uses precious land and water resources or instead uses GM processes to produce isolated glycosides that have no history of use in the amounts now being consumed? Why not go healthy, sugar- and stevia-free instead? NOTE: You are welcome to use my blog’s original images and content for non-commercial purposes but only if if you attribute the work to me (Kathy Abascal) and link back to the blog. This work is licensed under a Creative Commons Attribution-Noncommercial 3.0 United States License. This entry was posted in chemicals, Food and tagged blood sugar, gene silencing, healthy diet, rebaudioside, stevia, sugar, sweeteners, TQI, TQIDiet, zero calorie. Bookmark the permalink. Thank you for the very interesting article, Kathy. At first I was surprised when Dr. Hyman recommended eliminating even Stevia. But it makes sense. One year I grew a couple of stevia plants here in Bellingham. I dried and ground the leaves into powder. the powder doesn’t dissolve very well in liquids – hot or cold. But it was useful in mixing up salad dressings. I wonder about just including a few leaves in salads – fresh or dried – sauces, etc. That doesn’t make it hugely sweet. There must be some nutritional value to the leaf. I do agree we have to retrain our sweet-tooth. Even the fruits we eat are far sweeter than they were one or two hundred years ago. Adding a little stevia leaf to a dressing is not the biggest nutritional problem confronting us. BUT, it is important that we abandon our habit of sweetening foods that do not need that concentrated sweet taste, The average American eats 32 teaspoons of sugars a day because we sweeten salad dressings, mustards, mayonnaises, and a host of other food. We become accustomed to – and end up preferring – sweetened food. If you use a quality oil of a taste and flavor that suits you (there are near endless varieties of good quality EVOO) with a well made vinegar (again of a flavor that you enjoy) with added flavors from herbs, spices, and maybe some fruit, you won’t need that stevia. I predict that you actually will enjoy the wonderful flavors of quality ingredients in good balance if they are not buried by that overly sweet taste of stevia. Finally, I seriously doubt that the “nutritional value” in that little bit of added leaf is in any way is important. I lived my first 30 years as a mega junkfood nut. With great difficulty, I eliminated sugar, flour and beer in an effort to stabilize my blood sugar. I went from eating 150grams of high glycemic carbs per meal to less than 30g of low glycemic carbs every few hours. Thankfully, fruit and vegetables DID begin to taste good. BUT I was still using bits of raw honey, organic maple syrup and no-sugar added jams daily. Stevia helped me eliminate those as well. Anyway, if Stevia can get you away from that sugar /flour/alcohol addicted lifestyle it is a great tool for that purpose and may help save your life. (I am hoping it will help my wife break free) But if you are already well advanced improving your diet, I can see the benefit of removing Stevia. Healthy food will really will gradually taste better as Kathy has pointed out. There are many stevia will not help, instead they stay wedded to that concentrated sweet taste and eventually begin including more and more regular sweeteners. And most use the heavily manipulated, extracted glycosides instead of the green leaf. I’ve seen so many quickly move past the sugar habit without stevia that I really do not see the need for it.